Stockton Axson writes to Jessie about his plans to come visit her. I have been looking up schedules to Williamstown, and find that the way for me to go is to leave New York Wednesday midnight & go to Albany, take the train at Albany at 7:01, reaching Williamstown at 9:33 Thursday morning. 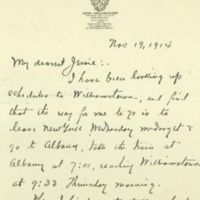 When I first wrote to you about coming for the Thanksgiving holidays it was my expectation to go by a day train on Wednesday, arriving Wednesday evening, but Dr. Leipziger wanted to arrange a new course of Wednesday evening lectures for me lasting until Christmas—a course which began last night. It seemed better not to wreck the whole scheme because of the one Wednesday evening before Thanksgiving, especially as I was sure I could get to you early Thursday morning either by way of Boston or Albany—they tell me at the Grand Central Station that it is better to go by Albany. So after I get through lecturing next Wednesday night I shall go to the station and go to bed, & be in Williamstown Thursday morning at 9:33. I shall then have no other lecture engagement until Monday afternoon in Germantown.Meemee Brown's father died suddenly in Ohio 10 days ago. She and Marjorie went on to the funeral, Meemee returned to New York two days ago to be with her doctor this week, and will go back to Ohio Saturday. Marjorie is in Ohio now. Meemee told me to give you all kinds of messages of love when I see you. Here is a first instalment now. I am in New York only one day in the week now (have been here four days a week until recently) and so have seen Mrs. Howe and Annie only once; but shall be seeing them again soon—and the next time it must be a day-light visit when I can see Josephine. They are all well. Axson, Stockton, 1867-1935, “Stockton Axson to Jessie Woodrow Wilson Sayre,” 1914 November 19, WWP17506, Jessie Wilson Sayre Correspondence, Woodrow Wilson Presidential Library & Museum, Staunton, Virginia.